With AND CO you can simply connect to our third party apps and automate your business workflows seamlessly via our integrated apps right in the settings of your AND CO account! 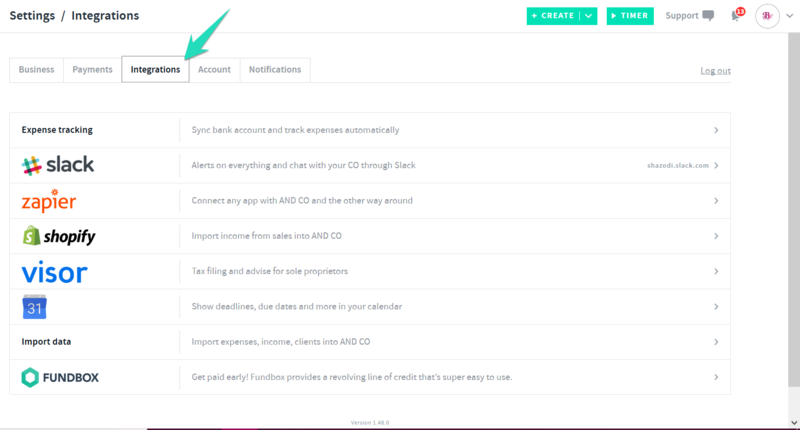 Select the app you wish to connect to and follow the prompts to integrate your accounts with AND CO.
Connect to Slack so you can get alerts on everything as well as chat to your Chief Operators through Slack plus more! Connect freakin' any app with AND CO and the other way around! Connect Shopify an automatically import your income from your sales into AND CO! Show your due dates, deadlines and more on your calendar! Import your Clients, Income and Expenses via CSV file into AND CO! Our integration with Fundbox gives you quick access to a revolving line of credit. You can get a decision in minutes and funds deposited into your account as soon as the next business day if approved.